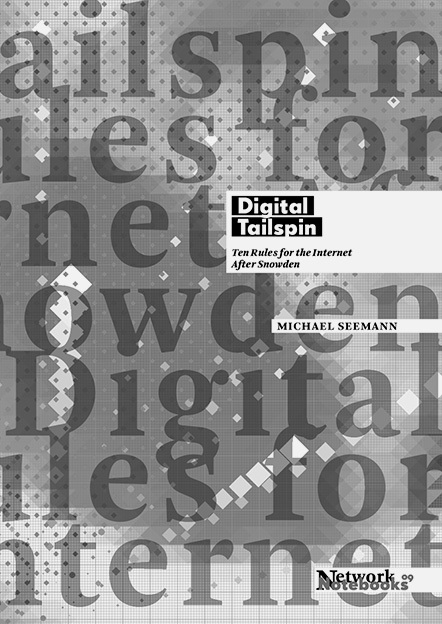 With the reauthorisation of the USA PATRIOT Act up for contestation on 1 June 2015, German net activist Michael Seemann’s recent book Digital Tailspin: Ten Rules for the Internet After Snowden couldn’t be a timelier contribution to the debates surrounding mass digital surveillance, network neutrality and information freedom. Seemann’s insights reverberate far beyond the issue of government surveillance, however, as they depart from the awareness that the datafication of life profoundly affects us all on both the individual and collective level, and that the algorithmic filtering of information has reduced reality to a false image entirely of our own (and of corporations’) device. This reader put out by the Institute of Network Cultures in Amsterdam is the ninth edition in the exciting Network Notebook series, which explores cultural activities as topical and varied as the selfie, the offline library, tactical media strategies, and glitch art, among other markers of our time. Seemann essentially provides a handbook of symptoms and strategies that might help us identify and manoeuvre our way through this generalised condition or new paradigm of what he calls Kontrollverlust: the total loss of control of information in the digital age. Taking mass surveillance and Kontrollverlust as our “default settings,” the author builds a convincing ethics and practice of a post-privacy Internet, weaving in analogies and important lessons from the fields of activism, artistic practice, racial politics, feminism, clandestine migration, the monitoring and scrutinising of citizens receiving social benefits, and even our culture of public online shaming. More crucially, he argues that this informational tailspin is met with a cognitive and emotional lack, seeing people — unaware of their emergent subjectivity and power — rendered unable to imagine a different Internet, as they continue to operate within the outdated frameworks of privacy, closed circulation and centralised platforms. To fully explore and harness the possibilities contained within this new and otherwise disorienting reality, Seemann maintains we must wipe the conceptual screen blank and begin counting from zero. First and foremost we must take an inventory of our priorities and what we think we know. Central to this task is elevating the importance of the query and platform neutrality. In doing so, Seeman does not suggest that we simply succumb to calls for a re-nationalised, fenced-in net in the face of the NSA revelations that spurred collective paranoia on a global scale. On the contrary, he rejects proposals for building alternative, national net infrastructures, warning that they are useless in treading the totalising reality of entangled global surveillance networks. Moreover, such privacy-geared approaches paradoxically encourage even more stringent border fortifications and laws, essentially granting the state more power, and paving the way for more pervasive forms of policing and centralised control mechanisms. In this sense, Seemann reminds us that the state has emerged perhaps stronger than ever before, having established a monopoly of power over today’s primary space of knowledge production and circulation: the Internet, and more specifically, online platforms. But technology itself does not translate to power or disempowerment; rather, it is our use of its tools that holds the potential of shaping or undermining political action and social change. Against the state’s colonisation of online life, Seemann charts several escape routes that could guide us out of the current impasse. If platforms have become the predominant site of social discourse formation, as he argues, and the query is at once product and producer of publics online (albeit a public that is always necessarily projected into the future), then the filtered query holds significant political import for collective coordination. His proposition of "filter sovereignty" within the parameters of open data encapsulates a pure end-to-end approach in which users control the filtering of data they simultaneously create and digest. The real question is to what extent we are really free to think, if our realities are controlled by algorithmically filtered information delivered to us by the likes of Google, Facebook, and Twitter, and how we might otherwise mobilise the “organizational power of the query.” Filter sovereignty demands of us to simultaneously surrender to Kontrollverlust and embrace open information and the ensuing concomitant streams of redundant data. It calls on us to engage more actively, responsibly, and patiently with digital information. This would satisfy something akin to an ethics of the online Other as well, as closed platforms by their very nature breach what Seemann calls “the radical right of the inquirer,” just as much as they limit the free speech of the sender. What is at stake in this book are ways of harvesting Kontrollverlust so as to galvanise a new culture of democratic information exchange that is strengthened, not threatened, by the digital tailspin. Seemann’s is a remarkably brave and visionary proposition, and the varying strategies he maps out will surely revitalise the discourse of net theory and digital freedom for some time to come. While it might be tempting to claim that his ideas indirectly anticipate the advent of new forms of creative, cognitive labour that could potentially operate outside of the click-for-profit models imposed on us from above, Seemann notes that closed platforms will continue to exist as long as capitalism is alive. Still, he urges us to remember that Google and Facebook are neither the first nor last giants of the Internet, and furthermore, that we are only in the nascent stages of a new paradigm that is ripe for more rigorous interpolation. Şeyma Bayram is a writer, editor and curator based in New York City. She received her BA and MA from the State University of New York at Binghamton. Privacy is a defensive right that protects a person’s private life. However, the ‘right to be left alone’ is not just a legal but also a political and social construction. Therefore, this is a concept that, although established by law, can be experienced and observed differently by individuals and groups, depending upon their position in society and the desires and interests attendant upon that. For instance, privacy can be an urgent topic for civil rights movements, whereas citizens apparently are less bothered about it. And so more and more government measures can be taken and new technologies applied that conflict with the right of privacy but which are used in a relatively unconcerned way or submitted to with hardly a whisper of protest. Whether this be an endangered basic right, an obsolete concept of the enlightenment, a lost cause or an activists’ obsession, the traditional notion of privacy has largely been undermined in today’s security and information society. This certainly is the result of a preventive government policy that is out to control the comings and goings of citizens, and a commercial sector that, off-line and online, tries to get more and more of a handle on the individual desires and consumption patterns of customers through its clever registration devices. But there is more going on: people are having less and less qualms about voluntarily revealing personal information in the media and on the Internet. The protection of privacy seems to be subordinate to people’s desire to manifest themselves publically in society. In the globalized network cultures, visibility, transparency, accessibility and connectivity are what count. These values are at odds with the idea of privacy as ‘secluded from the rest’. Does this imply that ‘everyone belongs to everyone else’ to an increasing extent, as in Huxley’s dystopic Brave New World (1932)? Or, these many years after The Fall of Public Man (Richard Sennett, 1974) are we experiencing ‘the fall of private man’ – from which we could then conclude that the public-private antithesis has lost its force as a signifier of meaning? Are alternative subjectivities and rights emerging that are considered more important in the twenty-first century? Are new strategies and tactics being mobilized to safeguard personal autonomy and to escape forms of institutional biopower? In Open 19, the concept of privacy is examined and reconsidered from different perspectives: legal, sociological, media theoretical and activist. Rather than deploring the loss of privacy, the main focus is on the attempt, starting from our present position of ‘post-privacy’, to gain an idea of what is on the horizon in terms of new subjectivities and power constructions. Naturally, this cannot be investigated without paying attention to the sociopolitical and technological violations of privacy that are going on at present. Daniel Solove, law professor, proposes that privacy be considered as a pluralistic concept with a social significance. A theory on privacy should be directed at the very problems that create a need for privacy, according to Solove. Maurizio Lazzarato, taking Foucault’s concept of ‘pastoral power’ as an example, analyses how the state wields power techniques to control the users of social services, and how it intervenes in the lives of individuals in doing so. Sociologist Rudi Laermans goes into the implications of the ideal of transparent communication for secrecy and personal privacy. In search of effective strategies against the surveillance regime, Armin Medosch, media artist and researcher, has developed a model in which he couples the historical function of privacy in a free democracy with the overall technopolitical dynamics. Felix Stalder examines today’s ‘post-privacy’ situation, in which a change is taking place in how people achieve autonomy, and how institutions and corporations exercise control over them. In the column, Joris van Hoboken, member of the board at Bits of Freedom, challengingly states: ‘Privacy is dead. Get over it.’ Oliver Leistert uses a post-Fordian framework in criticizing the German protest movement AK-Vorrat, which focuses on issues concerning data retention and privacy from a liberal democratic standpoint. Martijn de Waal considers the concrete possibilities of using locational data from cellular networks for civil society projects and the questions on privacy that this raises. In the light of contemporary computer paradigms like the Internet of Things, Rob van Kranenburg argues in favour of making concepts of privacy operational from the bottom up in the infrastructure of technologies and networks that connect us with one another in our environment. Mark Shepard has made a contribution on ‘The Sentient City Survival Kit’, his research project in the area of design, which proposes playful and ironic technosocial artefacts that investigate the consequences that the observing, evermore efficiently and excessively coded city has for privacy and autonomy. Matthijs Bouw, architect and director of One Architecture, investigates privatization and privacy in the context of the Internet platform ‘New Map of Tbilisi’. With photos by Gio Sumbadze and Lucas Zoutendijk, he shows how the ‘wild capitalism’ of the new Georgia has led to a reduction of privacy in Tbilisi.